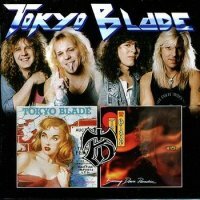 This review covers Tokyo Blade - 'Blackhearts And Jaded Spades / Ain't Misbehavin'' and Tokyo Blade - 'No Remorse / Burning down Paradise'. The answer, it transpired, was 'No Remorse'. 'Ain't Misbehavin'' was recorded for German label Scratch Records, and the band – well, Andy Boulton anyway – were under contract to deliver another album. That Tokyo Blade no longer existed was not a problem in the eyes of the label – they dumped Boulton in the studio with a bunch of German musicians and pretty much just pressed 'record'. Yes, it sounds like a recipe for disaster, and on its release 'No Remorse' copped some of the worst reviews ever written. The bizarre thing though is that if you can get past vocalist Michael Pozz's helium-inspired cartoon-character vocal delivery, it's not a bad album at all in places and has weathered the passage of time much better than the two that preceded it. Opener 'The Eye Of The Storm' is a pretty hot workout and 'Crystal Gold' has a pleasant latter-day Rainbow ring to it. Elsewhere Boulton's 'Chains Of Love' is Rainbow's 'Stone Cold' pretty much note for note (although rescued by a nifty solo and some nice backing keyboards), '5 Inch Catwalk' takes 'Walk This Way' and cross-dresses it with Sabbath's 'All Moving Parts (Stand Still)', 'Call Me Angel' shamelessly rips off Aerosmith's celestial being and 'Moonlight In Martini' (nowhere near as bad as it sounds) and 'Fever' both come across as pleasant enough slices of Eurovision power-pop. Only 'Angel' and 'Tears Are Not Enough' stick their heads out of the drawer marked 'By God, this is terrible', and that's only really because Pozz's stab at deep, booming vocals are cringeworthy. With no promotion the album stiffed immediately, leaving Boulton nursing his wounds and wondering what to do next. The answer, it transpired, was 'Burning Down Paradise', which brought things pretty much full-circle. In 1990 Boulton hooked up with Alan Marsh in Mr Ice (a name presumably won in a 'what's-the-worst-name-for-a-metal-band' competition). Although this thawed pretty quickly bridges were built and Marsh and Boulton, together with Colin Riggs and Mark Angel from Mr Ice and a returned-to-the-fold John Wiggins, were soon to wave the Tokyo Blade banner once more. 'Burning Down Paradise' was released in 1995 and, as the music world had moved on considerably by then it found itself largely unwelcomed by reviewers at large. A shame, because it's apparent that in the interim the boys had been listening to Metallica; and the genetic crossover between an original NWOBHM band searching for its roots and the biggest band in the world influenced by the movement, created a dynamic album which, had it been released ten-twelve years earlier, would have set the world on fire. But this wasn't the early Eighties, it was the mid-Nineties, and by this time the world already had one Metallica it was getting bored of and no-one was interested in Tokyo Blade; not even a Tokyo Blade as revitalised as this.